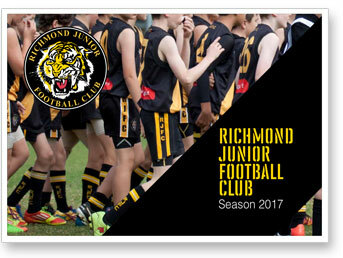 In 1973, a new football club arrived – Richmond Junior Football Club. It all kicked off at our treasured Citizens Park, still home of the Tigers. Best not to go looking for any black jumpers with yellow sashes. Our original jumpers, and they were real woollen jumpers, were yellow with a black “V” adorning the neck. We played in what was then known as the Hawthorn Districts Junior Football League. In 1996 the league merged with the Doncaster and Districts Junior Football League to form the Yarra Junior Football League, which operates with some 37 clubs, 365+ teams and nearly 9,000 registered players. In that period of time we have proudly won 12 Premierships. The club rooms, if they could be called that, were some rickety buildings near what it now the health centre at the Church Street end of the ground. Stories about these rooms paint a very sparse picture, with not so much a wall between opposing teams, rather more a cloth divider. Fortunately the new/current pavilion arrived in 1994 and while they have served us well, will soon be outgrown by rising player numbers. So far we have produced one AFL player – Tom Roach. We honour Tom by attaching his name to our summer development squad. We would love one day to be naming a new squad after our next AFL drafted player – we hope that’s not too far away! The club has been well served by many volunteers during its life so far. While the long serving one’s are remmebered on our Life members honour board, if we had a board large enough we’d like to mention all those parents and supporters that have taken on countless volunteer tasks week to week, year to year to support their son or daughters journey with RJFC. Many past players have moved onto to further their football with suburban, metropolitan and country leagues such as multiple best and fairest winner Kris Bardon, currently starring at Vermont FC. Most importantly, we strive to continue to provide the local boys and girls an opportunity to learn and participate in a support team based environment. The story of RJFC is far from complete…..We look forward seeing or current stars write new history, and would love to hear from past players/officials if they have any RJFC history. Please contact the web site administrator.